Visiting a Las Vegas dentist for regular checkups and teeth cleanings is an essential part of maintaining strong teeth and a healthy smile. Preventive dental care such as regular checkups, cleanings and x-rays can improve your overall health and wellness, and help you avoid costly and uncomfortable dental problems down the road. If this is your first visit with our Las Vegas dentist, we will some diagnostic X-rays, which can diagnose problems such as impacted teeth, abscesses, cysts, bone loss and decay between the teeth. During your first dental visit, one of our experienced dentists will review your dental and medical history with you and perform a comprehensive oral examination that includes evaluating your teeth and mouth for decay, cavities, gum disease and any abnormalities. The dentist will also perform an oral cancer screening and take note of existing dental work, missing teeth, cavities and fractures. 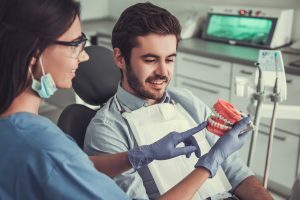 The dentist will also review your x-rays and discuss dental treatment recommendations and options, address any questions or concerns you may have, and work with you to create a customized treatment plan designed to fit your individual needs. Depending on your treatment plan and our office scheduling, you may even be able to begin treatment the same day! Professional hygiene visits usually are performed by one of our highly-trained dental hygienists. The hygienist will determine which hygiene mainteance is going to help you sistain your oral health by measuring your gum and bone levels. They will use special dental instruments to remove the calculus (tartar) and plaque from your teeth, polish to remove any additional plaque and stains, and use Laser therapy to remove any harmful bacteria from your gingiva. Leaving your mouth looking and feeling squeaky clean! We highly recommend you print out our Dental History, Medical History and Patient Registration forms and fill them out prior to arriving for your appointment. The three forms are available here individually or you can print out all three on the link labeled “Patient PDF Forms.” Fill out these forms as accurately and detailed as possible and bring them with you on your first visit, as this greatly assists our dentists in developing the best care plan for you. If you haven’t completed the forms ahead of time, plan to arrive 30 minutes before your scheduled appointment time to fill out the three forms and provide insurance information. Desert Breeze Dental accepts most PPO dental plans and offers financing through Care Credit. We also accept checks, cash, credit cards and Health Savings & Flexible Spending Accounts. With completed patient forms and insurance card in hand, you are ready for your first appointment! Your caring and knowledgeable Las Vegas dentist looks forward to serving your dental care needs. If you have any additional questions regarding your appointment, please call us at 702-869-0032 today.